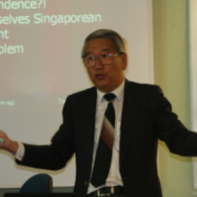 Joseph C. P. Lau, graduated from the then University of Singapore (known as National University of Singapore today) with a professional degree and later obtained his postgraduate qualification in strategic management from University of Hull, UK. He worked as a professional during the first few years of careers and then ventured into the field of marketing and management for the next fifteen years; handling products from processed food (Yeo’s), beverage (Pepsi Cola), toiletries (Faberge) to electrical durables (Panasonic). During the 90s, with the burgeoning of management training and development and lifelong learning, he switched career path and since then, he has trained nearly 90,000+ trainees from 76 countries. As a Singaporean, he had the opportunities to witness transition of pragmatic governance vis-à-vis strategic economic growth; escalating astronomically from USD 300 GDP per capita (in the year of independence – 1965) to USD 58,000 in 2017, despite the weakness of almost nothing in natural resources. He is one of the few effectively bilingual trainers. Besides delivering academic programs in as an adjunct professor for EMBA with Shandong University (China), University of Tartu (Estonia) and Kazan State University (Russia), he has been conducting training and development programs for about 20 such organisations in Singapore.